Harry’s panel, made by his lover Alex Nicholls, pays tribute to Harry’s Scottish heritage – and his big heart. Alex says Harry did not fit the traditional, frugal Scots stereotype at all. He was a generous, warm-hearted man who would give the shirt off his back to anybody in need. No frills or glitter for Harry – just a big heart. So it seems appropriate that the dominant image in the middle of this panel should be an enormous padded heart. It is set on a background of yellow cotton – yellow is a favourite colour of Harry’s. One half of the heart is made from Alex’s family tartan which has a dark green background. A white rose and scotch-thistle brooch which belonged to Alex’s great-grandmother clasps the two tartans together. Deep within the dacron padding lies a special letter to Harry from Alex. Quilting has traditionally involved groups of people and Alex says that every member of his family has added a stitch or two to the heart. In the top right-hand corner of the panel, there is a calico tribute booklet where family and friends have signed their names. Harry’s own name stands out in bold tartan lettering beneath the heart, with two white doves – symbols of peace – holding the corners of the fabric ‘plaque’. 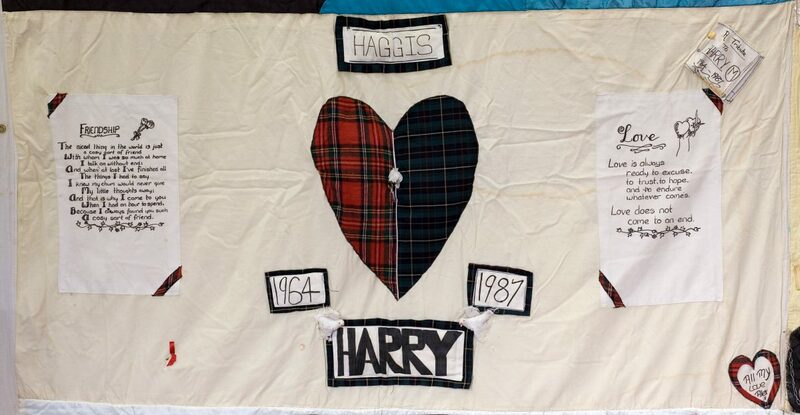 A similar tartan framed plaque above the heart bears Harry’s nickname ‘Haggis’. The dates of his birth and death are placed on either side of the lower portion of the heart. On the left-hand side of the panel is a friendship poem treasured by Alex and on the right side a favourite verse of Harry’s which speaks of Love. These have been handwritten by Alex and trimmed with the appropriate tartans. Alex says that making this quilt panel for Harry helped him to pull his shattered life together and to get on with living after the shock of Harry’s sudden death.